It was great to see everyone at Morning Assembly today! I hope everyone had a safe, relaxing, and renewing Spring Break! Speaking of Morning Assembly, I challenged everyone to finish off the rest of the year strong by being protectors and putting forth their best effort. The 3rd - 8th graders will get a chance to do this in a meaningful way with the upcoming ILEARN tests. Look for more information next week about ILEARN with a timeline of when we will be taking it. 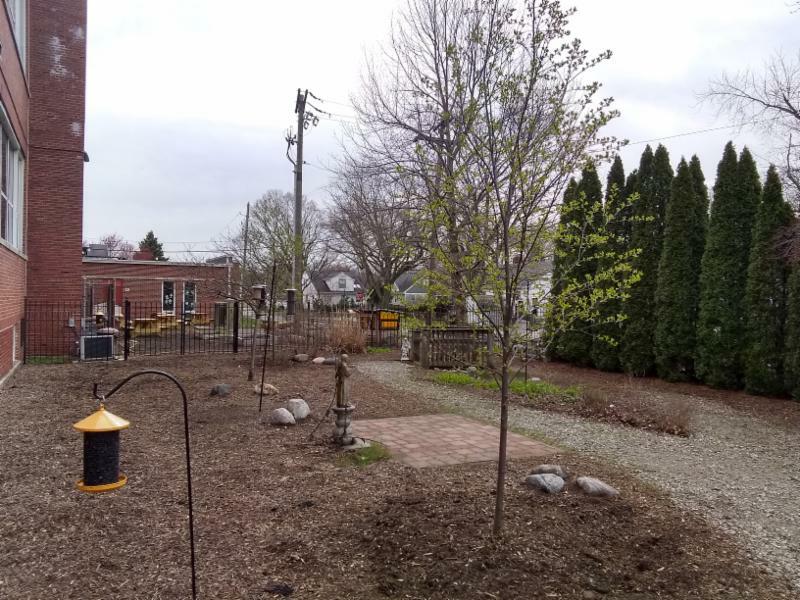 I added a picture of the Saints Isidore and Maria Garden because we will be hosting the first preschool field trip at the garden this week. The 7th grade has been busy planning activities to engage Northminster students during their visit this Wednesday. We are proud of our students and Mrs. Quinton for planning this inaugural event and plan on inviting other preschools to visit us soon. I am looking forward to celebrating Holy Week with you starting with Palm Sunday this Sunday. A schedule of Holy Week events can be found below. The trees along the parking lot have been removed and construction could begin soon to improve the drainage on Norwaldo. I have been in contact with city officials and will provide you with timely information. I have already had discussions with Bishop Chatard, and we are working on several alternate pick up and drop off plans to implement, depending on what our access to Norwaldo will be. I will share these plans when they are finalized. There is a restraining order in place against the suspect that led to our eLearning days before break that applies to the Bishop Chatard and Christ the King campuses. He has been charged with felony intimidation. I am in constant communication with Joe Hansen from Bishop Chatard and will share all updates that are pertinent. Both campuses will be under daily IMPD supervision for the rest of the year. The door codes will remain disabled until a safety audit is completed. I will keep you updated regarding the timing and results of the audit. Please let me know if you have any questions and thanks again for the patience and understanding that everyone displayed during the eLearning days before break. Christ the King Fish Fry! Save the dates and volunteer to help! The annual Tiger Trot walk-a-thon was once again a success this year ! Funds raised will be announced on Friday, April 12th. Our students enjoyed a fantastic day of fun and excitement and, in the process, raised funds to support the the following: (1) Chromebooks for ILEARN and general STEM use (2) The “Dream Big” Teacher Scholarship where teachers submit ideas for a big classroom learning projects (3) PTO initiatives throughout the entire year including class trips, teacher appreciation, and classroom grants. Thanks to all students, parents, and staff for supporting this event. A special thanks to our Mystery Tiger, Father Todd, our Master of Ceremonies, Shiloh O’Rourke , and all of our volunteers who took time out of their busy schedules to help make this event successful. A list of all volunteers will be published with the final results on Friday. We also want to thank Indianapolis Fruits for in-kind donations of bananas (4 years in a row), Mark Miller of Markey's Rental & Staging for discounted audio equipment and set-up (many years in a row), Officer Jeremy Messer for security (more than 8 years in a row), and Tom Mahaney from Bishop Chatard for street barricades (4+ years in a row). Stay tuned for a final update this Friday. Our next handwriting session (and the last one of this school year!) will begin after Spring Break on Thursday, April 11th, and go until May 16th.